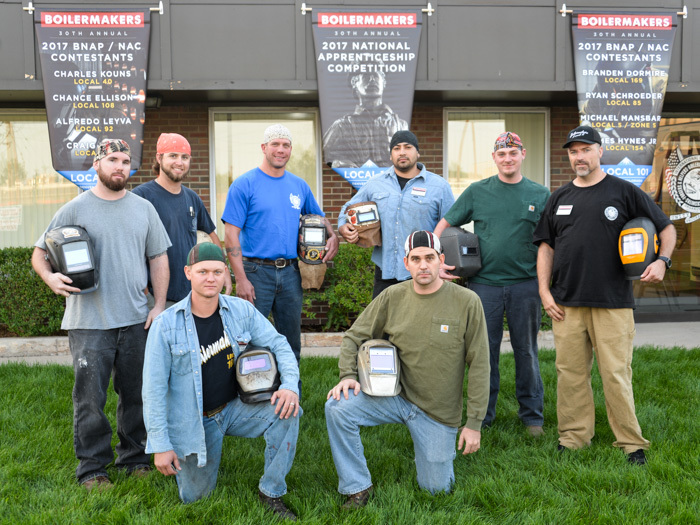 Competitors at the National Apprentice Competition face off at Local 101 in Denver. Front row, left to right: Branden Dormire, L-169 (winner) and Ryan Schroeder, L-85 (runner-up). Back row, left to right: Michael Mansbart, L-5 Zone 5; Chance Ellison, L-108; James Hynes, L-154; Alfredo Leyva, L-92; Charles Kouns, L-40 and Craig Rose, L-101. 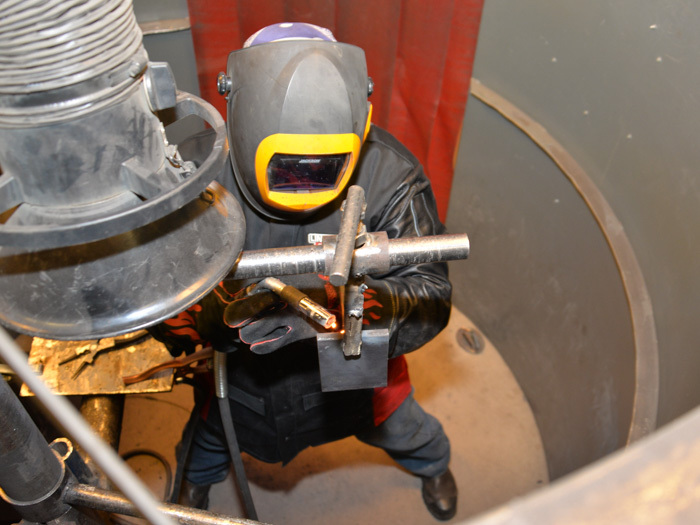 Winner Branden Dormire, L-169, double-checks his measurements for the final placement of the burner during the team rigging exercise. Runner-up Ryan Schroader, L-85, marks the hole pattern for his layout project. Craig Rose, L-101, finishes a 3G MIG pass. 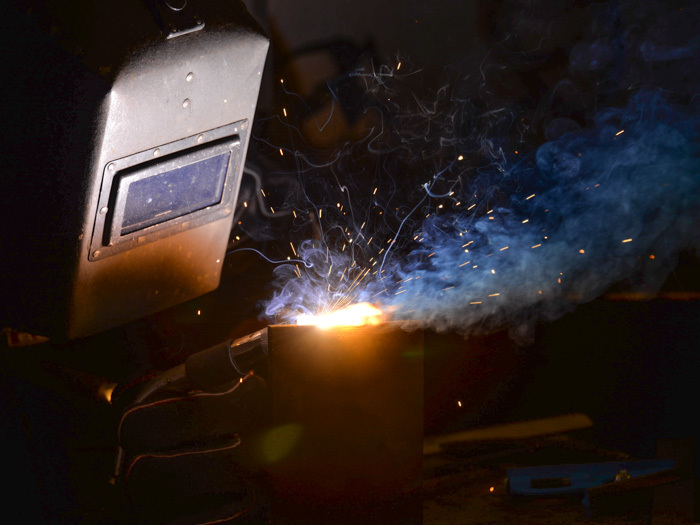 Charles Kouns, L-40, lays in a final pass during the MIG welding exercise. 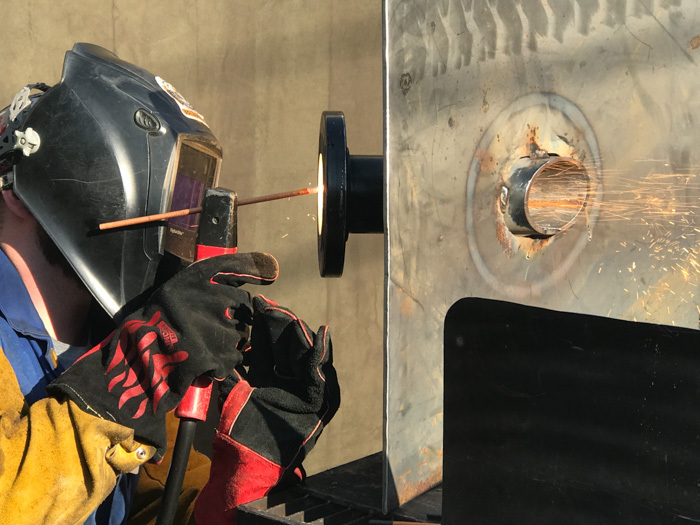 James Hynes, L-154, inserts a root pass during the team welding competition. 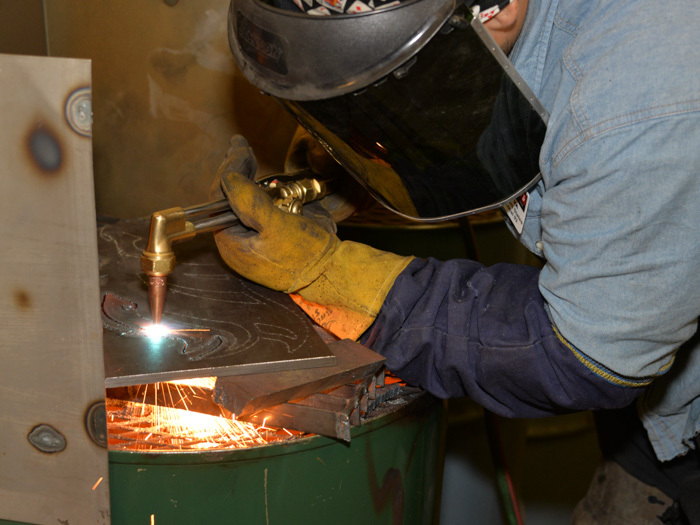 Alfredo Leyva, L-92, uses an oxy-acetylene torch to cut out a pattern during the layout project. 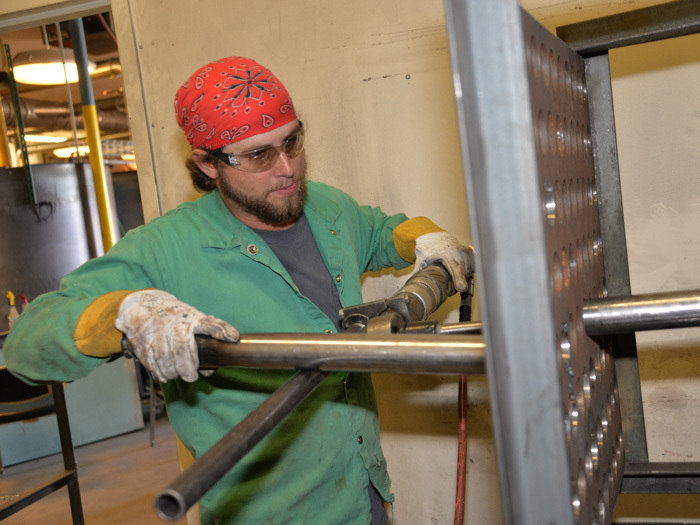 Chance Ellison, L-108, prepares to remove the final inches of tube stock during the tube rolling project. Michael Mansbart, L-5 Zone 5, demonstrates his arc gouging skills by removing a flange from a previous project. 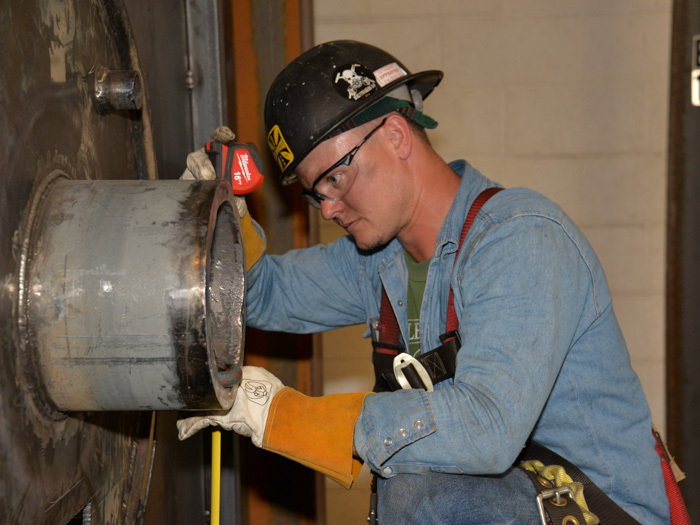 BRANDEN DORMIRE, A member of Detroit Local 169 (Great Lakes Area), won top honors at the 2017 National Apprenticeship Competition held at Local 101 (Denver) August 20-23. This was the third year in a row a graduate apprentice of L-169 took top honors and the local’s fifth top finish in the last six years. Ryan Schroeder, a member of Local 85 (Toledo, Ohio), was named runner up. Team honors went to the Great Lakes Area, which paired winner Dormire and runner-up Schroeder. Also competing were Chance Ellison, Local 108 (Birmingham, Alabama); James Hynes Jr., Local 154 (Pittsburgh); Charles Kouns, Local 40 (Elizabethtown, Kentucky); Alfredo Leyva, Local 92 (Los Angeles); Michael Mansbart, Local 5 Zone 5 (New York) and Craig Rose, Local 101 (Denver). 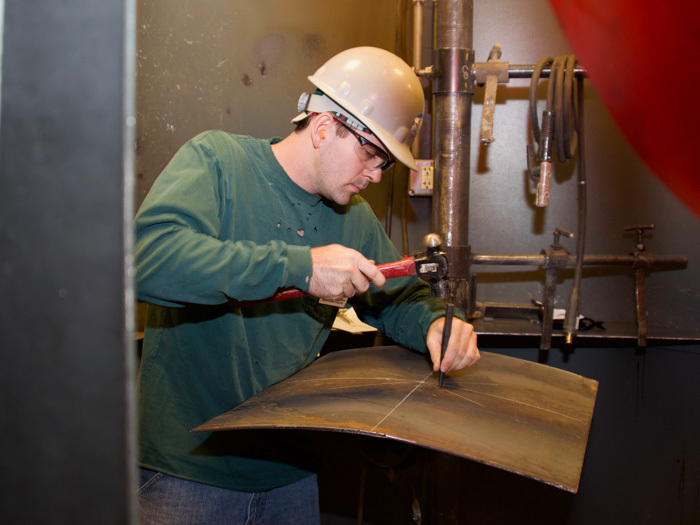 To reach the national competition, which is sponsored by the Boilermakers National Apprenticeship Program, contestants had to finish in the winner or runner-up spot in their respective area competitions. Candidates competed on a written exam covering their four years of related studies and on-the-job-training, blueprint reading and safety. 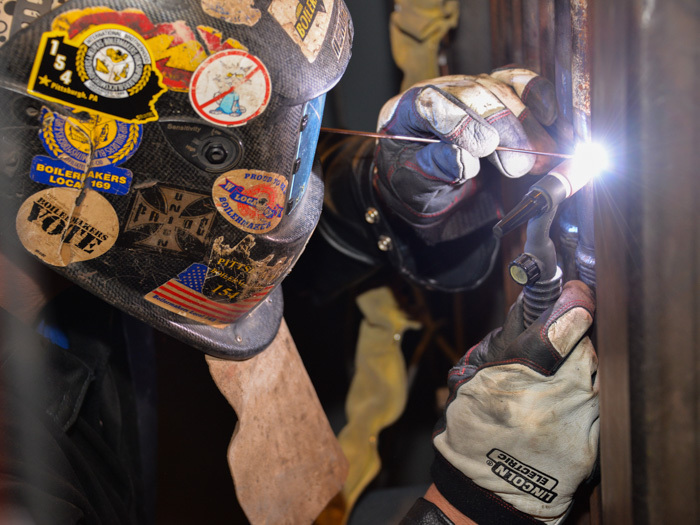 Hands-on competition included rigging, layout and fabrication, tube rolling, knot tying, hand signals, reeving, and equipment use along with welding and cutting. Judges scored contestants on safety and on overall knowledge and demonstrated skills. The lead judge for the competition was Michael Stanton (Local 154, Pittsburgh). Other judges for the event included, by area: Western States — Ron Mayor (AP Com/GE) and Tim Atencio (Local 101); Great Lakes — Brian Dowden (Sterling Boiler & Mechanical) and Nick Tokarz (Local 374, Hammond, Indiana); Southeast — Chuck Harvey (Babcock & Wilcox) and Monte Causey (IR-CSO); Northeast — John Cammuso (Babcock Power, Inc.) and James Paglia (Local 28, Newark, New Jersey); and National Transient Division — Jimmy Tatom (CB&I) and Monte Causey (IR-CSO). The candidates were recognized and awards were presented at a dinner held August 23 at the Westin Denver Downtown. Presenters included International Vice President - Great Lakes Larry McManamon and BNAP Program Coordinator Mark Wertz, who also served as master of ceremonies. Bank of Labor presented Dormire with its inaugural Pinnacle Award, which honors the achievements of the top graduate apprentice.